Modern transceiver systems require diversified design aspects as various radio and sensor applications have emerged. Choosing the right architecture and understanding interference and linearity issues are important for multi-standard cellular transceivers and software-defined radios. A millimeter-wave complementary metal–oxide–semiconductor (CMOS) transceiver design for multi-Gb/s data transmission is another challenging area. Energy-efficient short-range radios for body area networks and sensor networks have recently received great attention. To meet different design requirements, gaining good system perspectives is important. 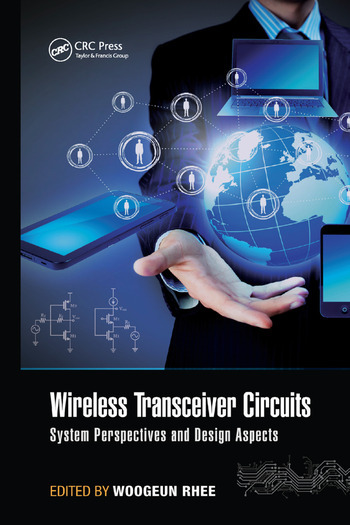 Featuring contributions from renowned international experts in industry and academia, Wireless Transceiver Circuits: System Perspectives and Design Aspects makes an ideal reference for engineers and researchers in the area of wireless systems and circuits. Photonics-Enabled Millimeter-Wave Wireless Systems; Jeffrey A. Nanzer, Timothy P. McKenna, and Thomas R. Clark, Jr.
Woogeun Rhee holds a B.S. from Seoul National University, South Korea; M.S. from the University of California, Los Angeles, USA; and Ph.D. from the University of Illinois, Urbana-Champaign, USA. Previously, Dr. Rhee was with Conexant Systems, Newport Beach, California, USA, and the IBM Thomas J. Watson Research Center, Yorktown Heights, New York, USA. In August 2006, he joined the Institute of Microelectronics at Tsinghua University, Beijing, China. He holds 19 U.S. patents, has edited numerous scientific journals, and is a member of the Technical Program Committee for the IEEE ISSCC and the IEEE A-SSCC. "This book is great for academic professionals and researchers working in multiple areas of wireless transceivers, since the coverage is comprehensive."